What do the symbols mean in your 2015 MI Code Book? 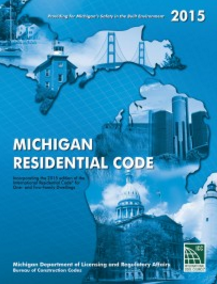 Michigan builders are required to have access to the 2015 Michigan Code Book by their renewal date, May 31st, 2017. The new code book is based off the 2015 International Building Code Book, with slight changes made by the state. While most of the book remains the same, lines, arrows, and bullets are used to designate changes made by Michigan or the International Building Code (IBC). DOUBLE VERTICAL LINES Show amendments and changes to the IBC codebook by Michigan. SINGLE VERTICAL LINE A change from the 2012 codebook, implemented by the IBC. SINGLE BULLET Marks code that has been moved from its location in the 2012 codebook. DOUBLE BULLET Marks the new location of codes moved in the 2012 codebook. ARROW Present where a section of code deleted from the codebook by the ICC. ASTERISK Appear near sections of the code that Michigan has decided not to adopt. STILL NEED TO RENEW YOUR MICHIGAN BUILDERS LICENSE? Complete your state-required continuing education. Courses are available online. Go to the LARA website to renew your license online. There will be a $150 renewal fee, fees must be paid by Visa, MasterCard, DiscoverCard, or electronic check. *Don’t own a credit card? Prepaid credit cards are available at most gas stations & grocery stores. Save your continuing education certificates for 6 years in case of a state audit. WHAT HAPPENS IF YOU DON’T RENEW YOUR MICHIGAN BUILDERS LICENSE? You are not legally allowed to work as a builder in the state of Michigan if your license has expired. Charges and steps for reinstatement depend on the duration of your license lapse. More than 3 years 1. Complete 60 hour prelicense course – available online. This entry was posted in Construction and tagged Michigan Builder Renewal, Michigan Builders.